Vancouver, B.C., Corvus Gold Inc. (“Corvus” or the “Company”) - (TSX: KOR, OTCQX: CORVF) announces the latest assay results from the first 10 drill holes of a 33 hole program on private (patented mining claims) land within the Jolly Jane deposit known as the ZuZu Zone.Â Initial results have shown the outcropping at the ZuZu zone to be thicker and overall higher grade than the previously defined estimated resource in this part of the deposit, as illustrated by hole NB-12-195 returning 47 metres of 0.60 g/t gold starting at surface.Â Drilling at Jolly Jane was designed to upgrade and expand the existing inferred gold resource to measured and indicated for inclusion in the Mayflower project feasibility study, presently underway and scheduled for release in Q1 of 2013. This additional zone of mineralization on private land could significantly enhance the economics of the Mayflower project by adding additional early stage gold ounces where production is anticipated for late 2014. *Intercepts are approximate true width and calculated with 0.1 g/t gold cut-off and up to 3.0 metres of internal waste. Jeff Pontius, Corvus Gold CEO, stated:Â “The ZuZu Zone offers a great opportunity to add to our proposed early production at the Mayflower project with its very low strip ratio and deep oxidation.Â We look forward to the rapid completion of this strategic drilling program as well as the return of the remainder of the Yellow Jacket high-grade zone drill results which should be available in the next few weeks.Â As our work progresses at North Bullfrog, we continue to be encouraged as this exciting mining opportunity moves closer toward becoming Nevada’s next operating gold mine”. The Company’s recent updated Preliminary Economic Assessment for the North Bullfrog project (see NR12-37, December 6, 2012) highlighted the opportunity for additional leach pad capacity for the Mayflower project.Â The ZuZu zone at the Jolly Jane deposit (Figure 1) has emerged as a possible source for low strip ratio oxide mineralization also situated on private land to take advantage of this added capacity. 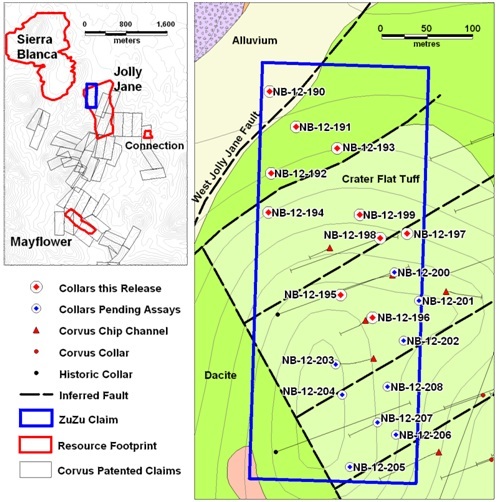 Â A drill program was initiated in November 2012 and initial results have shown that good continuity exists in the zone and it is thicker than originally projected.Â Following return of all assay results a new estimated resource will be calculated and utilized in the ongoing Mayflower feasibility study which will form the basis for the mining permit submission scheduled for Q2 2013. Â The ZuZu program will consist of 33 holes totalling 4000 metres, and is scheduled for completion in January, 2013. The first drilling has defined the northern limits of the mineralization bounded by a fault down dropping the preferred host unit below volcanic cover and has also confirmed the structural and host rock continuity of the mineralized zone to the south. Â It appears that mineralization is closely related to a set of NE-trending structures that may have acted fluid pathways. Figure 1:Â Location of the ZuZu Claim and drill holes reported in this release. Topographic contour interval is 10 metres. The project currently includes numerous prospective gold targets, with four (Mayflower, Sierra Blanca, Jolly Jane and Connection) containing an estimated Indicated Resource of 15 Mt at an average grade of 0.37 g/t gold for 182,577 ounces of gold and an Inferred Resource of 156 Mt at 0.28 g/t gold for 1,410,096 ounces of gold (both at a 0.2 g/t cutoff), with appreciable silver credits.Â Mineralization occurs in two primary forms: (1) broad stratabound bulk-tonnage gold zones such as the Sierra Blanca and Jolly Jane systems; and (2) moderately thick zones of high-grade gold and silver mineralization hosted in structural feeder zones with breccias and quartz-sulphide vein stockworks such as the Mayflower and Yellowjacket targets.Â The Company is actively pursuing both types of mineralization. This press release contains forward-looking statements and forward-looking information (collectively, “forward-looking statements”) within the meaning of applicable Canadian and US securities legislation.Â All statements, other than statements of historical fact, included herein including, without limitation, statements regarding the anticipated content, commencement and cost of exploration programs, anticipated exploration program results and the timing thereof, the discovery and delineation of mineral deposits/resources/reserves, the potential for the identification of multiple deposits at North Bullfrog, the potential for a low capex and/or opex heap leach mine operation at North Bullfrog, the potential for there to be a low strip ratio in connection with any mine at North Bullfrog, the potential for the existence or location of additional high-grade veins, the potential for any mining at ZuZu to enhance the economics of the overall project, the proposed completion of a feasibility study for either Phase 1 (Mayflower) or Phase 2 (North Project) or both of the North Bullfrog project, the potential for a production decision to be made for either Phase 1 or Phase 2, the potential commencement of any development of a mine at North Bullfrog following a production decision, the potential for any mining or production at North Bullfrog, whether by 2014 or at all, the potential for additional resources to be located between certain of the existing deposits, the potential for mineralization from the ZuZu area to be mined and processed in connection with any heap leach at Mayflower, or at all, the potential for the Company to secure or receive any royalties in the future, business and financing plans and business trends, are forward-looking statements.Â Information concerning mineral resource estimates and the preliminary economic analysis thereof also may be deemed to be forward-looking statements in that it reflects a prediction of the mineralization that would be encountered, and the results of mining it, if a mineral deposit were developed and mined. Â Although the Company believes that such statements are reasonable, it can give no assurance that such expectations will prove to be correct.Â Forward-looking statements are typically identified by words such as: believe, expect, anticipate, intend, estimate, postulate and similar expressions, or are those, which, by their nature, refer to future events.Â The Company cautions investors that any forward-looking statements by the Company are not guarantees of future results or performance, and that actual results may differ materially from those in forward looking statements as a result of various factors, including, but not limited to, variations in the nature, quality and quantity of any mineral deposits that may be located, variations in the market price of any mineral products the Company may produce or plan to produce, the Company's inability to obtain any necessary permits, consents or authorizations required for its activities, significant increases in the cost of labour, materials, equipment and supplies required to develop and operate any mine at North Bullfrog, the Company's inability to produce minerals from its properties successfully or profitably, to continue its projected growth, to raise the necessary capital or to be fully able to implement its business strategies, and other risks and uncertainties disclosed in the Company’s latest interim Annual Information Form and interim Management Discussion and Analysis filed with certain securities commissions in Canada.Â All of the Company’s Canadian public disclosure filings may be accessed via www.sedar.com and readers are urged to review these materials, including the technical reports filed with respect to the Company’s mineral properties.